Be the first to share your favorite memory, photo or story of Floy. This memorial page is dedicated for family, friends and future generations to celebrate the life of their loved one. 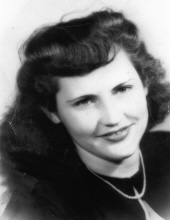 Floy Gray Smith, of Athens, died Monday, April 1st, 2019 at her residence. A graveside service will be held in Athens City Cemetery on Saturday, April 6th at 2 p.m. Stan will be officiating. She is preceded in death by her husband, Maurice “Lefty” Glen Smith; son, Glen Smith; parents, Edward and Dulcie Daniel Gray; brother, Frank Gray and sister Doric Gray. She is survived by her nieces, Peggy Woodward and Sherry Harrison. Visit rogersvillefh.com to share memories and condolences with the Smith family. To plant a tree in memory of Floy Gray Smith, please visit our Tribute Store. "Email Address" would like to share the life celebration of Floy Gray Smith. Click on the "link" to go to share a favorite memory or leave a condolence message for the family.